Whew! That would be my sigh of relief for finally having a moment of "calm" amidst the chaos that our life has been over the last three weeks. Let me just give you a rundown of what's been going on, cause holy crap is there a lot to update you all on. About four weeks ago, the doctors found another lump on my Dad's neck--this time on the left side. A week later, they did a CT scan that gave cause for concern but no definite answers so they scheduled a needle biopsy to test whether what they were feeling was cancerous or not. Within a week, the doctor had scheduled surgery for the following week without having biopsy results in order to not waste any more time in case the tumor was malignant. Results came back pre-surgery confirming doctor's suspicions: the cancer was back. During all of this, Luis and I had flown back to Germany and decided that, since no opportunities seemed to be presenting themselves in Europe, we would get ready to move back to the States within the next month or so and see what's available in the MLS. However, once we got news of my Dad's surgery, we made it our goal to be back in time for the Fourth of July, the day Dad would be released from the hospital. And so, in the span of 2 weeks we sold all of our furniture--all of it--to include our lights, closets and kitchen, which sold in less than 12 hours. Our makeshift bed for a night before a friend loaned us an air mattress for our last few nights in our apartment. We learned a painful lesson that we probably could have sold our kitchen for a lot more given how quickly it sold and how many phone calls we received about it. We sold most of our furniture to military members using Ramstein Yard Sales. If you are an expat in Germany, this site is a must for you. You can buy and sell almost anything from or to Americans on here! We crammed into a U-Haul type truck and delivered our furniture to the buyers. That is how I had to sit most of the way, squished among the couch cushions. Then I could see his sweet face. We packed and mailed a dozen or so boxes with small things that would be a pain to replace i.e. hangers and some kitchen utensils, to my parents who will store them for us until we figure out where we are headed next. It took some skill getting them into the car. 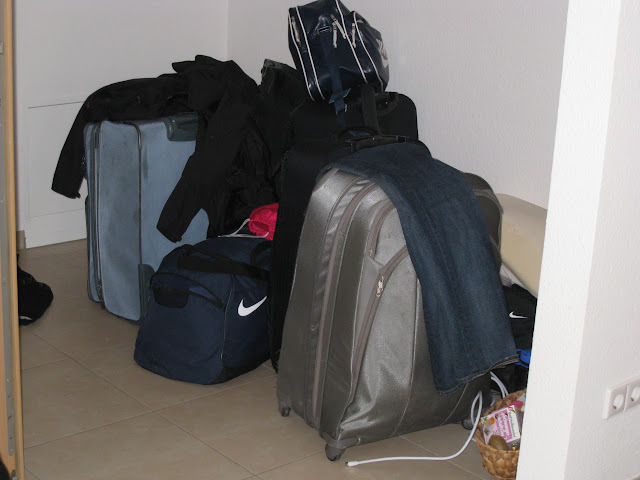 Luckily Willi, our German teacher's husband, is a retired architect and found a way to perfectly pack them all in. We had to take two cars to get us and our suitcases to the airport. It was an adventure for sure. Especially once we got to Charlotte and had to transfer all eleven suitcases, just the two of us. I do not, do not, do not recommend moving when you are 6 months pregnant, at least not in the time frame of two weeks. And not when you have to move across an ocean. In the summer. In a city that is hot and humid as all get out. In a country that does not have air conditioning. Just a helpful tip I learned through my experience. My poor husband was a champ carrying every piece of furniture, every box, every suitcase down our stairs. Husband of the Year for sure for all his hard work and putting up with his hormonal, stressed out wife! Despite the stress, long days and the aches of our bodies, we were blown away by how perfectly God worked every single little detail out so perfectly. Right down to things like, I had JUST enough face wash, body wash and lotion to last me through our last day there which means I didn't have to throw away partial bottles or figure out where they could go in our already too full suitcases. Oh, and another amazing blessing? Given the ridiculous prices for flights from Germany to America, especially when purchased only a week away from the desired departure date, we decided to use our miles and somehow it was less miles to fly first class then to fly coach. No joke. Luis even asked the agent on the phone if that was correct. She didn't understand it either but said, "Yep, it looks like that's correct." So we flew first class on our last flight from Germany to America. We made it home in time to enjoy a few fireworks on our drive from the airport back home. Dad's surgery went well. They removed the tumor as well as some lymph nodes around it. They also tested a small sample on the right side that they were concerned about but it ended up being just a cluster of cells that had grown around the sutures remaining from the last surgery. We are hopeful that this was just a small bit that didn't get killed by radiation and that this will be the last of the cancer for him! He is recovering well and anxious to get back to his full strength. We are enjoying the extra, unexpected time at home, however, we are also anxiously awaiting an answer as to what's next for us. We see God working in so many ways, especially with how smoothly the move went, and trust that He will reveal something...it just seems to be taking him a lot longer than we maybe would like Him to take. And that's where we're at. Homeless. Unemployed. Uninsured. Pregnant. Yet fully confident in where the Lord has us and is taking us. Happy Monday! I continue to learn so much about faith from you two. I'm glad you are home and safe even if still unsure about what is next. Please let me know if there is any way we can be helpful! are so blessed to have each other and your faith. Welcome Home. Am anxious to meet Luis!!!! !